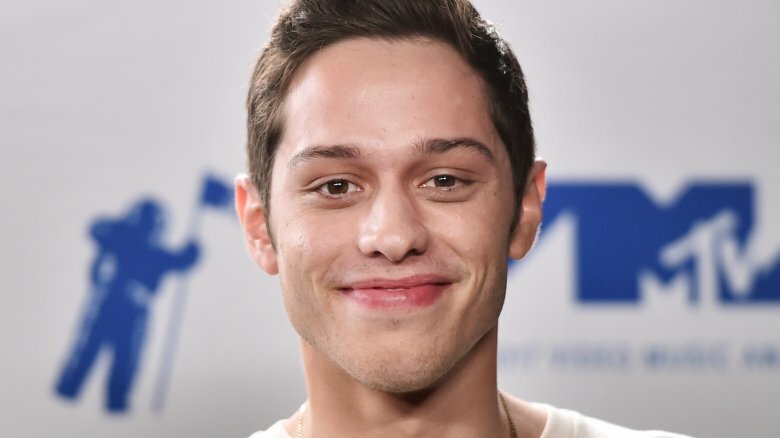 Even if you didn't know comedian and actor Pete Davidson from his cameo in Amy Schumer's 2015 film Trainwreck or his Saturday Night Live skits, it's likely you can't avoid his name anymore. 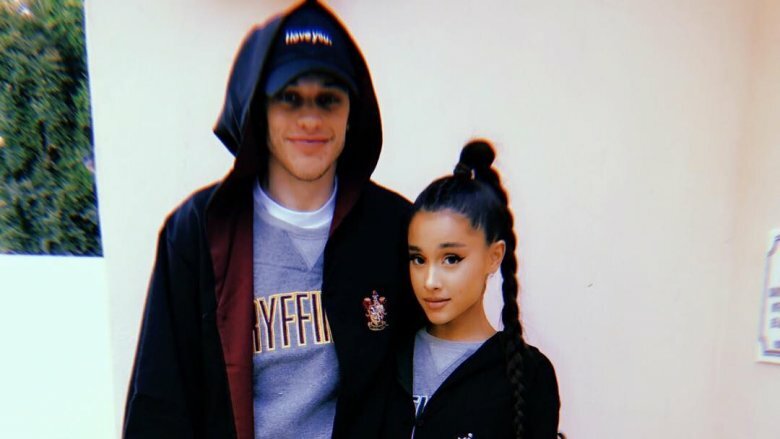 Thanks to his speedy engagement to pop star Ariana Grande, Davidson's name and face have been splashed across every tabloid and gossip site as people do their best to process the couple's expedited relationship. 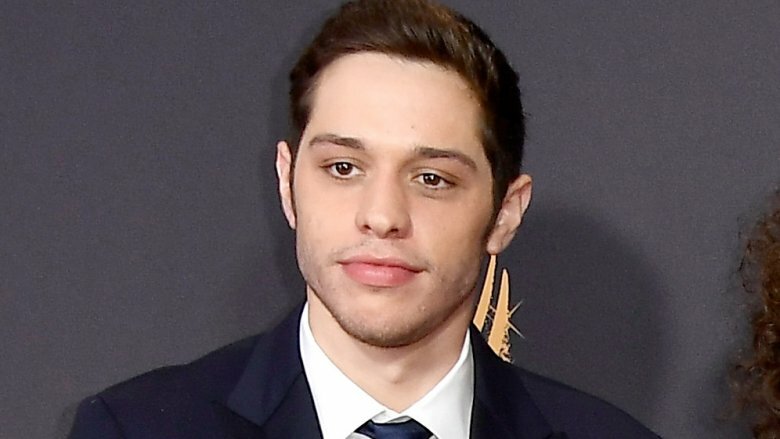 While the twenty-something Staten Island native is no stranger to mingling with the rich and famous (he's been in relationships with some high-profile women before and is friends with the likes of Kid Cudi and Nick Cannon), his recent engagement to Grande raised eyebrows for a number of reasons and left us with a lot of questions. Didn't they both just get out of relationships? Is this engagement the real deal? How did they even meet? 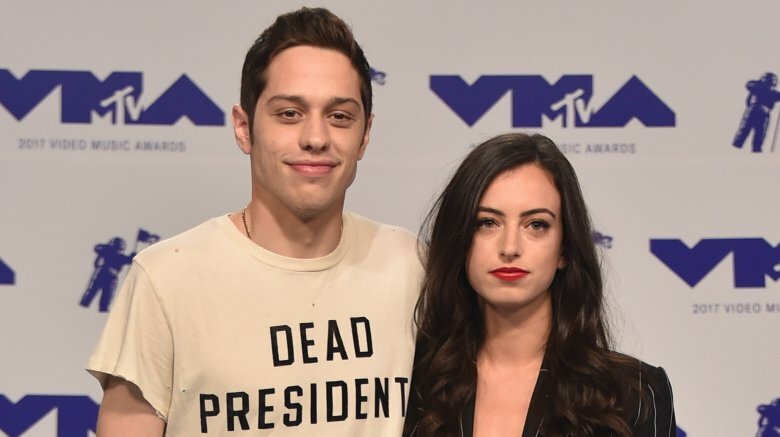 And most importantly, who is Pete Davidson, really? Davidson's father died during 9/11 when the young comedian was just 7 years old. According to the New York Times, his father, Scott, was a New York firefighter who was last seen at the Marriott World Trade Center hotel after responding to the call when the second airplane hit the World Trade Center tower. Unsurprisingly, the loss of his dad affected Davidson greatly. "It was sad how sad he was growing up," Davidson's mom told the Times, explaining that he became a "lab rat" for those studying the effects of the attacks on the children of September 11th victims. As devastating as the tragedy was for Davidson and his family, he's still used it in his stand-up comedy bits. 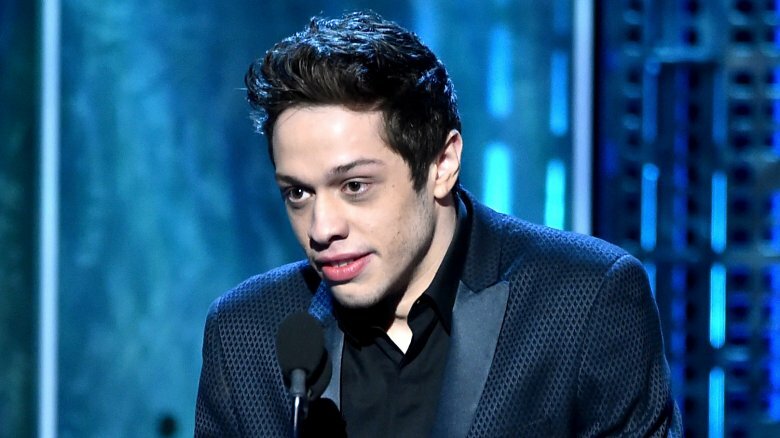 Most notably was the time he captured the entire room's attention during the 2015 Comedy Central roast of Justin Bieber. "I lost my dad on 9/11, and I always regretted growing up without a dad. Until I met your dad, Justin," Davidson joked. "Now I'm glad mine's dead." 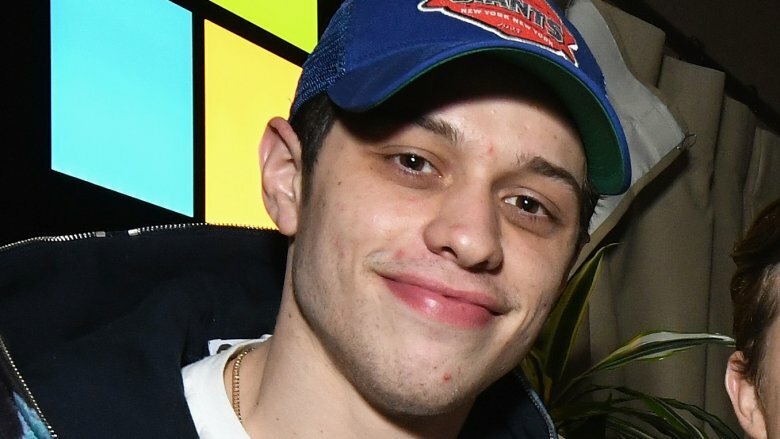 In a 2016 interview, Davidson told Peter Rosenberg that he worries that the reasons he gets jobs is because of his status as a 9/11 victim's son. "That's why I started talking about it," Davidson revealed. "I was hoping if I did a bit about it or I made fun of it in some way like it would go away." Unfortunately for Davidson, it seems being the son of a September 11th victim was not enough to keep bullies at bay. He revealed to radio host Peter Rosenberg that "people were mean" to him as he was growing up. "I was in school having a rough time grieving so I was acting out a little bit," he explained. "I didn't have any friends." Davidson said that he attracted negative attention when he would "act out" by "trying to be funny" when, in reality, he apparently wasn't. Davidson's behavior left him somewhat of an outcast in his grade. He relayed a childhood memory to Rosenberg in which he'd been invited to a kid's birthday party (one of the first parties he'd ever been invited to), but the kid ultimately told Davidson he was only invited because his dad died. "I had a really rough time," Davidson said. According to the The New York Times, Davidson attended three separate high schools growing up and faced bullying in all three, convincing him that people were mean. "Then I was like, Oh! It's me!" he told the Times. Bullying is never a good thing, and the negative effects on the person being bullied are countless. However, Davidson miraculously seems to have turned his rough childhood experiences with bullying into something positive. Davidson told Peter Rosenberg that he only had one real friend in high school, so, at the age of 16, he and that friend would go to open mic nights in New York City — the starting ground for his career. Davidson's mom told The New York Times that she was willing to do whatever made him happy after the death of his father, and doing standup "made him really, really happy." For Davidson, comedy clubs felt like home. "I just blended in perfectly," he told the Times, explaining that it was the first time he felt like people actually had to listen to him. As for how he landed a gig on SNL just a few short years later, Davidson said he owes it all to these trips to small New York comedy clubs. "I just did open mics and a bunch of shows, and then I started opening for this guy Bob Levy," Davidson shared, revealing that, after just two months, another comedian took him on the road and the rest is history. In a 2016 Breakfast Club interview, following a discussion about Davidson's use of medicinal marijuana, Charlamagne tha God (in no uncertain terms) asked the comedian if he had bowel issues. Davidson responded by revealing that he has Crohn's. "Whenever I wake up, if I don't hit the bowl or something, it'll feel like someone punched me in the stomach," Davidson explained. According to the National Institute of Diabetes and Digestive and Kidney Diseases, Crohn's disease is a chronic illness that affects the digestive tract. Unfortunately, the disease is not curable, but there are various treatments that those with the disease can try to alleviate symptoms and flare ups — for Davidson, that appears to be weed. While many people turn to nutritional therapy to manage their Crohn's symptoms, Davidson told the Breakfast Club crew that "healthy stuff" doesn't help him, but instead "just goes right through" his body. Davidson told the Breakfast Club in 2016 that he was a religious user of CBD, "a weed that makes your stomach feel better." He explained that he's a big proponent of getting the drug legalized so people can smoke marijuana that "doesn't really get you high" but "keeps you okay and able to work." In a 2017 interview on the WTF With Marc Maron podcast (via Rolling Stone), Davidson revealed that he had "been a pothead forever," but it seems he's been able to stay relatively sober when working. He told the Breakfast Club DJs that he used medicinal weed when he was at work. "I love getting high," Davidson said, but he claimed that he used CBD during work hours so he felt just well enough to do his job. However, during his interview with Marc Maron, Davidson said that, in 2016, he began having "mental breakdowns" that he originally attributed to his marijuana use. "I would, like, freak out and then not remember what happened after. Blind rage," he said. He eventually decided to go to rehab, where he received a surprising diagnosis. In 2017, Davidson seemed to disappear from Instagram, worrying fans. In March of that year, he reemerged with a since-deleted post (via Us Weekly), saying, "Just wanted to let you guys know I'm okay." In an ensuing interview on the WTF With Marc Maron podcast a few months later (via Rolling Stone), Davidson revealed that, in the time he was off of social media, he had been struggling with his mental health. He told Maron that he started having "mental breakdowns," which he originally attributed to the marijuana he was smoking. While at a rehab center, he was eventually diagnosed with borderline personality disorder. According to the National Institute of Mental Health, BPD affects a person's mood and behavior, often causing them to act impulsively. People were reportedly quick to bring up Davidson's diagnosis upon hearing news of his quick engagement to Ariana Grande, as relationships with those living with BPD are said to be tumultuous. "When they are in relationships they get very intensely involved way too quickly," Dr. Barbara Greenberg told Vice about people with BPD. "Everything is done with passion, but it goes from being very happy and passionate to very disappointed and rageful." Davidson addressed fan comments in a 2018 Instagram story, writing (via The Cut), "Just because someone has a mental illness does not mean they can't be happy and in a relationship. It also doesn't mean that person makes the relationship toxic." 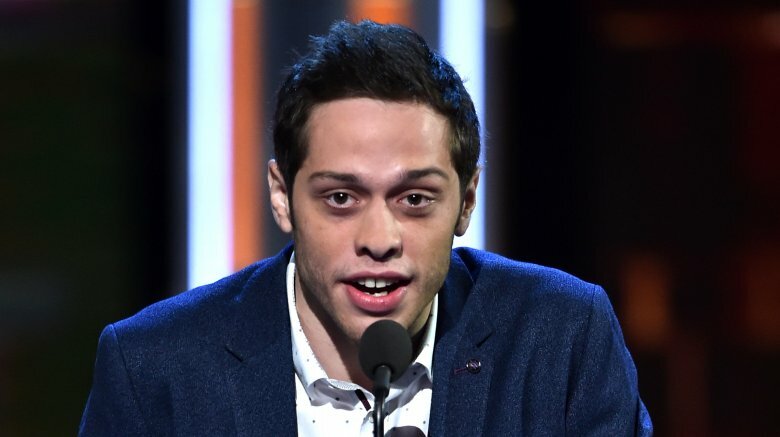 After his 2017 social media and Saturday Night Live hiatus, Pete Davidson returned online to address the reason why we hadn't seen him in quite some time. "I know I've kinda been missing, on social media and on the show," Davidson wrote in a since-deleted post (via Us Weekly). "I quit drugs and am happy and sober for the first time in 8 years." 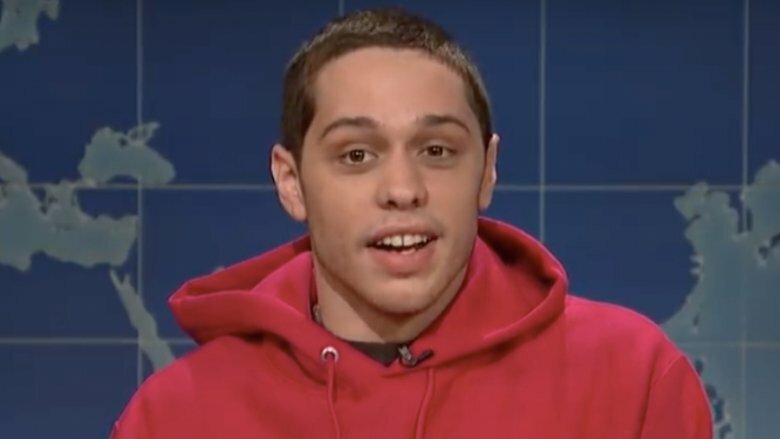 He then appeared on a May 2017 SNL episode to further discuss his absence and reveal the hefty price tag on his stint in rehab. "Never pick the rehab you want to go to when you're high," Davidson advised, joking that that's exactly what he did. He said he landed himself in a rehab facility that specializes in "horse therapy," which cost him a whopping 40 grand. Despite his time in rehab, it seems the comedian is no longer completely sober. "Party's back on," he said in a May 2018 interview with Peter Rosenberg. He revealed that he actually never had a problem with drugs, but instead suffered from a "mental disorder." He explained that, while he was sober, he still felt off. After being diagnosed with the disorder, Davidson said he "rolled a joint" and "was back immediately." 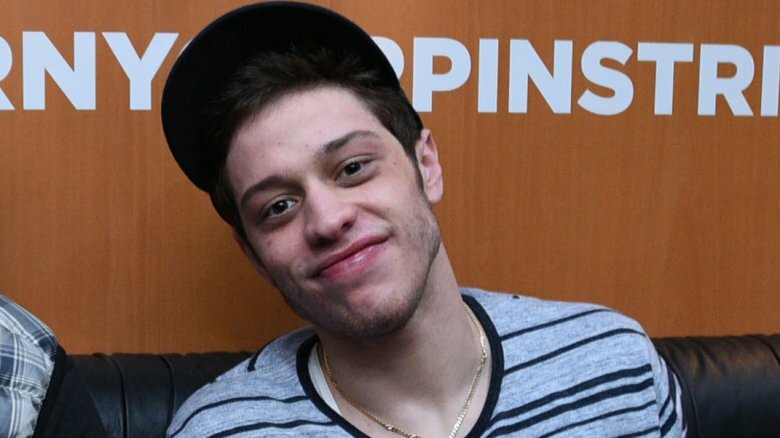 In a 2018 interview with Peter Rosenberg, Davidson called Kid Cudi's 2009 album Man on the Moon the "best album of all time." His love for Cudi is real, and Davidson has even gone so far as to say Cudi saved his life. He explained that the album came out when he was in his junior year of high school (which was smack dab in the middle of the time we know he struggled with bullying). In a Breakfast Club interview, he said he would've been dead if it weren't for that album. "I would've killed myself if it weren't for Kid Cudi," Davidson revealed. Davidson has raved about how he admires the way Cudi opened up throughout Man on the Moon, an album that's been praised for its honesty. As Aaron Williams wrote for Uproxx, "While rap music previous to Cudi's 'emoization' of the genre could and did touch on depression, alienation, isolation, and anger, it wasn't altogether too keen on analyzing or understanding these feelings — at least not on a mainstream level." For Davidson, it was "kind of comforting" knowing that Cudi, his "hero," was struggling with the same mental health issues that he was. Before his romance with pop diva Ariana Grande, Davidson was in a relationship with Larry David's daughter Cazzie. In fact, in 2016, Davidson seemed convinced that they were going to be together for a long time. "She's the (sic) best," Davidson said in an interview with Peter Rosenberg. While their relationship remained low-key for most of its duration, it wasn't totally without its drama. In 2018, Davidson took to Instagram to post a cryptic apology to Cazzie. Sharing a photo of the two of them holding hands, Davidson wrote (via Us Weekly), "Idk what I did to make you hate me so much but I'm sorry," only to delete the post 20 minutes later. A source told Us at the time that the two weren't fighting but rather joking "as comedians tend to do." By May 2018, Davidson revealed in an interview with Rosenberg that he and Cazzie were "not together." Did he cheat on Cazzie David with Ariana Grande? Not long after Davidson's breakup with Cazzie David, news broke about his relationship with Ariana Grande. While a source reportedly told TMZ that Davidson and David were "on a break" when he and Grande started seeing each other, the timeline seems a little fishy. So fishy, in fact, that a fan launched an investigation of the couple's relationship on Twitter with the theory that Davidson and Grande have been dating for much longer than people think. 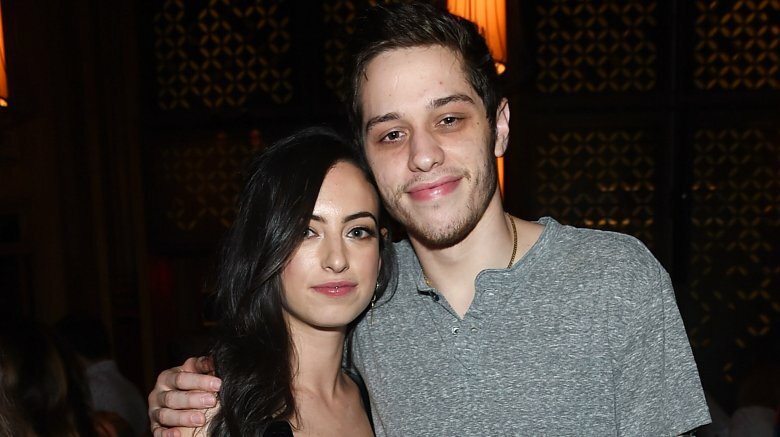 The Twitter user claimed that the relationship between Davidson and David, as well as the one between Grande and her ex Mac Miller, were nothing more than publicity stunts. The user posits that Grande and Davidson have actually been dating since 2016 and couldn't speak out about it due to their respective contracts. While the fan's timeline kind of adds up, it's also pretty far-fetched. But then again, so is the idea of a comedian and a superstar getting engaged within a few weeks of dating, so you never know. Despite Davidson's quick turnover from David to Grande, his love for his former girlfriend was real, if his tattoos are any indication. According to People, Davidson had a portrait of David tattooed on his forearm in 2016. But in May 2018, shortly before news of his relationship with Grande broke, Davidson's tattoo artist Jon Mesa shared a photo of a large cover-up of the ink. 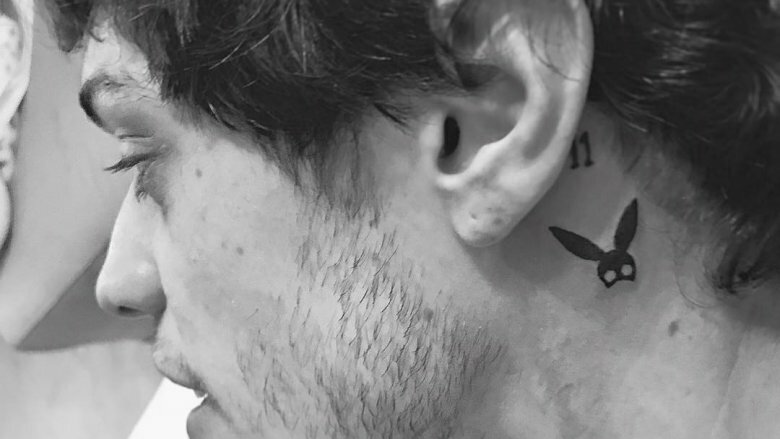 Not too long after, in June 2018, Davidson went back under the needle to get two Grande-inspired tats: her infamous rabbit mask behind his ear and her initials on his thumb. It is important to note, though, that Davidson still has at least one tattoo he got with his ex. David shared a photo on Instagram of matching "WE BABIES" tattoos that she shares with Davidson and Miley Cyrus. Despite being on the same arm as the original portrait of David, Davidson opted not to cover it up. We get it: love is all encompassing and can lead you to do some pretty crazy things. Like get engaged after 24 days of dating, for example. 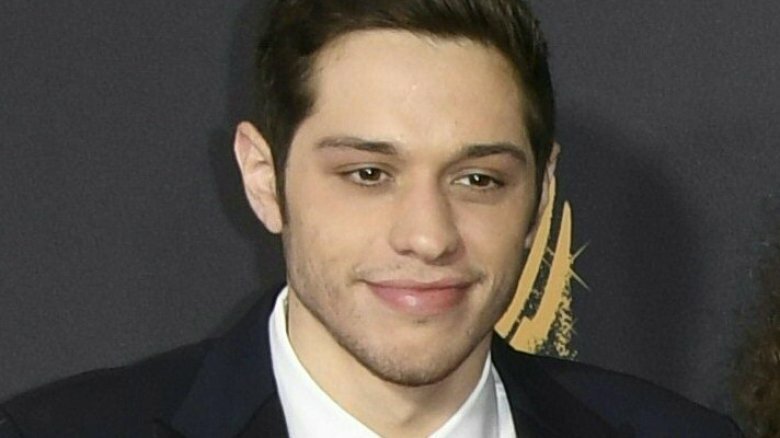 In June 2018, TMZ broke the news that Pete Davidson had officially asked Ariana Grande to marry him, to which she'd apparently said yes. It seems Davidson knew almost right away that Grande was "the one." His jeweler spilled that the comedian asked for the ring — which cost $93,000, by the way — about two weeks before the actual proposal. "Pete called me at the end of May and said 'Look, I'm getting a ring. This is what I want,'" the jeweler, Greg Yuna, told E! News. However, Yuna said he had no idea who the ring would go to at the time. Despite the speedy engagement, insiders revealed to Us Weekly that the two aren't in any rush to head to the altar. "They are a perfect fit. They are not rushing to get married," said one source. "They are looking forward to a very long engagement together," another shared.